Dr. Stephen Strange is a world renowned neurosurgeon who suffers a car accident that causes severe nerve damage to his precious hands. In need of healing, and as a last resort, Stephen travels to Kathmandu, Nepal, where, in a temple called Kamar-Taj, he learns the tools to heal his body through magic. But this ancient practice, and the three sanctums that protect it, are under attack by a zealot and his followers—former students at Kamar-Taj—, who want nothing but everlasting life and the Master of Darkness to rule on Earth as he does in the Dark Dimension. I thought that after the luscious world building and the ambitious scope of Thor, there was nothing new to tell or new ways to express them in the Marvel Cinematic Universe. Oh, how wrong I was! I thought Tony Stark (a.k.a., Iron Man) and Captain America were my favorite characters in the MCU, and now comes Dr. Strange, with the gifted and multifaceted Benedict Cumberbatch leading an all-star ensemble, and has made reconsider my other two favorite choices. I have already watched it four times, that's how much I liked it! Where do I begin? The world building is fantastic, and resembles somewhat some of the best movies that the genre of sci-fi & fantasy has to offer, such as Inception and Thor. 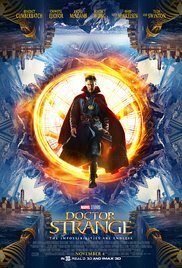 In Doctor Strange, there is a strange symbiosis of the esoteric, modern physics, and medicine that make for a very intriguing background for the movie and for the title character. Endless caving mirrors and folding edifices stand for "mirror dimensions"...Rolling floors and ladders floating in the space-time stand for multiple dimensions, and multiverses, both part of modern physics' last frontier. The casting is perfect. All the characters are spot on in their roles, and most of the males (Dr. Strange, Wong, Mordo, and the Zealot Kaecilius) have grave voices that give a theatrical feel to the movie as well as provide excellent voice-over moments. This production can be best defined as mind bending, but unlike in most cases, here it is an asset, it's a glorious thing. Sounds like you really found a winner in this one! Once again you have convinced me to add another movie to my queue. You make it all sound so intriguing! I like Cumberbatch and I might even watch a Marvel flick for him. He is a fun actor to watch and I look forward to him as Thomas Edison in The Current War. Dr. Strange sounds a bit magical. I wasn't aware he was to play Thomas Edison; that I must see. Doctor Strange was a bit magical indeed, but so much fun. Oh - this sounds excellent. Can't wait to see it. I enjoyed Doctor Strange but not as much as other Marvel superhero movies. It was a little too...esoteric, I think, for my taste. Right now I'm eagerly awaiting an opportunity to see Guardians of the Galaxy Vol. 2. The esoteric topic mixed with everything else was what I loved about it, but I know that's not everyone's cup of tea. I, too, am eagerly waiting for Guardians...volume 2 to come out for rental, and Wonder Woman too, which has performed phenomenally at the box office.